Another afternoon, another competition – that was the thought running through my mind when I turned up for this event. There was a good deal of overlap with the singers I had heard only a few weeks earlier in the Ferrier Competition, and there would probably have been more if the date had not clashed with the first showing of NOS’s Showcase. But I quickly revised my opinion as this proved to be a much more interesting event, with the contestants sparking off each other to produce a close fought and riveting finish. 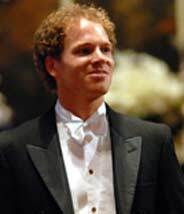 Justly Christopher Ainslie [pictured] emerged as the winner, against the odds as the rules of the competition require that singers present an operatic aria and a piece of mainstream German lieder – the latter a real problem for a counter tenor. His account of Dawn, still darkness from Jonathan Dove’s “Flight” was as near to perfection as anything I have heard in the Wigmore Hall. He had the advantage of being accompanied by the winning and highly supportive accompanist, James Baillieu, but in Nachtstuch, sung with considerable technical excellence, he could only achieve a sound which was a long way from anything Schubert envisaged, and the impression of a voice being played through an amplifier with the treble turned up too far prevailed. Sarah-Jane Brandon, who was awarded second prize, was popular with the audience. She was a little tentative in Cäcilie but Dvorak’s Song to the Moon suited her perfectly and she took full advantage. Third prize went to Ida Falk Winland a singer that, as in the Ferrier, failed to convince me fully of her merits. She showed off all the technique, but conveyed little of the meaning of her words. The award of the song prize to the Korean baritone Seho Changcaused a certain amount of surprise in the audience as he was obviously at a disadvantage in the German language. Personally I found his voice the most interesting of the afternoon, and he is certainly a singer I will endeavour to hear again. His operatic choice was the song to the evening star from Tannhauser which should, for me and probably others, have won him one of the higher prizes. The over-all standard was consistently high, so I must also give favourable mention to soprano Nina Bernsteinerwho dared to trespass into territory normally reserved for baritones by offering Schubert’s Erlkönig, and brought it off pretty well, but could have chosen a more showy operatic piece than Ei parte … Per piata. Bravado misplaced, but still a singer to look out for. British hopes rested on baritone Gerard Collett, whose voice was simply gorgeous in Brahms’ Wiegenlied and tenor Adrian Ward equally delectable in Massenet’s En ferment les yeux. It may not have been their day, but there is much more to come from both of them.